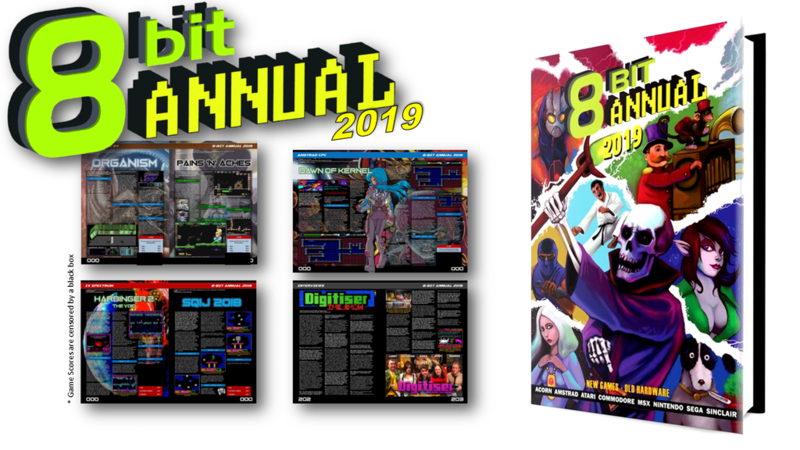 Melbourne, Apr 6, 2019 (Issuewire.com) – April 6, 2019 – 8-Bit Annual 2019 celebrates new games with over 200 pages, 8-Bit Annual 2019 is HUGE! It is the second printed book covering all new 8 bit home computer and console released home brew and commercial games from 2018, by the 8 Bit Annual team. Included is many features, game developer interviews and more than 150 game reviews on Atari, Atari 2600, NES, SEGA, Amstrad CPC, C64, MSX, BBC Micro and MSX. Each 8-Bit machine is given as much content as possible. Below is just a sample of the many games reviewed. For the C64 games reviewed include Shadow Switcher, Aviator Arcade II, L’Abbaye Des Morts, Space Monguls, Hunter’s Moon Remastered, Rocky Memphis & The Legend of Atlantis, International Karate Ultimate, Portal C64, and Speedball Duology. For the ZX Spectrum games reviewed include Ninja Gaiden: Shadow Warriors, Gimmick! Gandalf, Roust, Harbinger 2: The Void, Nixy: The Glade Sprite and O.P.Z. For the MSX games reviewed include Tragical Chase, Inq and Suq vs Nightmare, Draconic Throne and Shoulder Blade Overdrive. For the Atari 8-Bit games reviewed include Stunt Car Racer, Jack the Nipper, Skooldaze. For the BBC Micro games reviewed include Prince of Persia, Phoenix, Centipede, Maze of Madness, The Darkness of Raven Wood. For the Sega Master System games reviewed include Flight of Pigarus, Gemitas, Little Sokoban, Silver Valley, Prisonnier II, Galactic Revenge. For the NES games reviewed include Nova The Squirrel, Cheril the Writer, Yun V5. There are some FAB, MEGA and EPIC perks in the 8 BIT ANNUAL Kickstarter that should not be passed up by any retro-enthusiast or collector. iPGARD is Now Officially Relocated! Digital Media Company Announces Plans to Expand to NYC, Barcelona and London in 2019.